Zozo’s got this thing on his paw. We thought maybe he had, like, a hang nail or a torn cuticle or something. Dogs get those, right? It didn’t seem to bother him, so we let it be. Then it grew. And got scaly. And looked sort of like a horn sticking out the side of his pinky. It’s gross. And no, there are no pictures. Because it’s gross. Like every weird medical predicament we experience with Zo, we give it one more day and then take him to the vet. Googling his symptoms (horn growth thing on dog paw no fever doesn’t hurt him) yields some fairly interesting and… educational… results, but nothing canine- or veterinary-related. The vet’s awesome, as usual. They take his temperature. They take some blood. They take a peek and poke (doctorally, of course). Diagnosis: canine papilloma virus. In English? It’s a wart. Prognosis: good. Unless it starts to bother him, or if he starts to gnaw at it, let it be. Next day, there are tiny little blood specks across the floor. We follow the trail, and it leads to Zo. Gnawing at the horn. James calls the vet, and we schedule a surgical appointment. Our furrst child is heading under the knife. We fast him for a night and pick up his water when we turn in. We’re up with the dawn and waiting in the car for the vet’s office to open. As you may guess, I’m borderline hysterical. He struts his way in, gives his winningest smile to the techs (“Helloooo Ladies!”), and doesn’t look back. 6 hours later, the vet’s office calls. He did well and they’re sending the appendage to be biopsied. He’s still super groggy from anesthesia. They’ll call us when Doodle’s ready to be picked up. Another 5 hours, and we haven’t heard from the vet. I call, and they said we can pick him up, but he’s basically a big, drunk mess. I drive over, and he’s wobbly and unable to walk out by himself. I move my car to the door. I drop down the backseat, and a vet tech carries our 70lb goober to the car. Giggling and chatty, we made the drive home. He asks for Taco Bell. I ask that he settles down. James received a “you’ll never guess what’s going on” text, and he meets us outside since Zo’s too big for me to lift and carry into the house. Safely deposited on his dog bed, Zo spends the next 3 hours in and out of sleep, silly and loopy and smelly. We’re able to get some chicken and rice into his system, which helps start to sober him up. We help him outside for a potty break, and then it’s back to the couch. The next morning, he’s a bit more himself but the giggle-fest of last night has disappeared. He whimpers. He itches at his bandages. I stay home from work and James comes home early and we hunker down together. Even Athena is nicer to Zo than usual, sharing her favorite spot on the couch (my lap). Two days later, the bandages and e-collar don’t hold him back. He’s ripping paint from the wall and tripping up the stairs. Three days post-surgery our wound check goes well and the biopsy came back as expected. Warts. 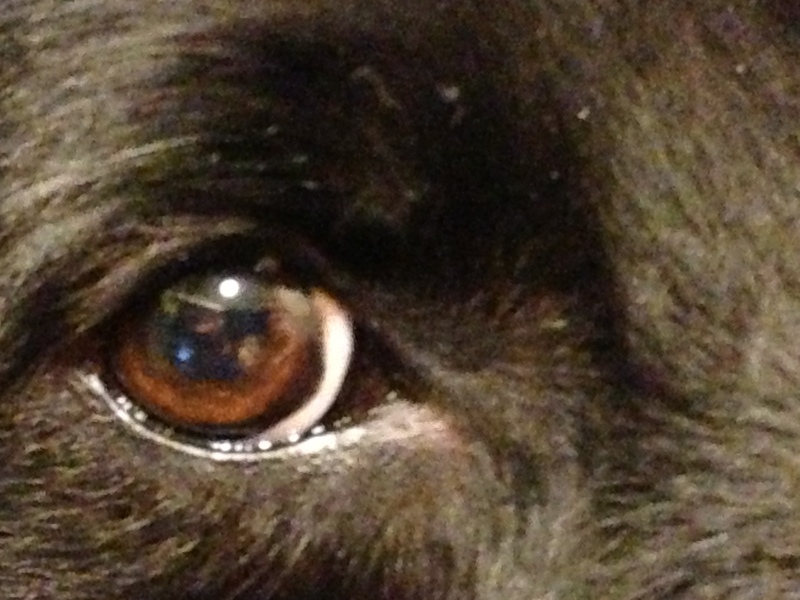 Fast forward to spring 2013… look very closely: see anything on his beautiful (upper) eyelid? This entry was posted in 2013 and tagged Canine Papilloma Virus, Canine Warts, Caring Hands Animal Hospital, Pet Surgery, puppy snuggles, rescue dogs, Zozo by klgf. Bookmark the permalink. Yep. We’re keeping a close watch, but early August he’s going back in.